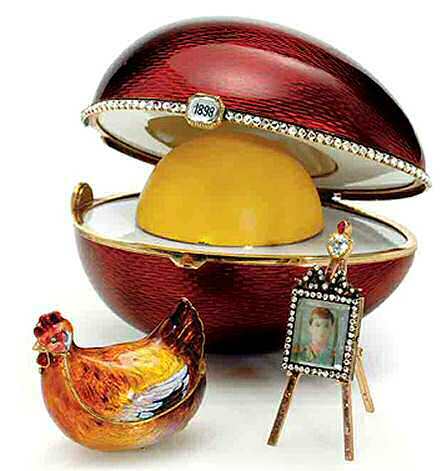 The 1898 Kelch Hen Egg is made of gold, rose-cut diamonds, portrait diamonds, translucent strawberry red, opaque white and matt yellow enamel, and suede lining. the miniature hen is made of gold and brown and white enamel. The miniature ease is made of gold, rose-cut diamonds, cabochon ruby, and watercolor, possibly on ivory. The surprise contained within is a gold easel set with rose-cut diamonds, the struts of which are hinged at the center to fold behind, as is the diamond and ruby-set cresting. The frame now contains a portrait of the Tsarevich alexei wearing the uniform of the Fourth Rifle Battalion of Guards. The easel is marked with Cyrillic initials of workmaster, Fabergé in Cyrillic and assay mark of 56 standard for 14 karat gold, also with French import mark. The Egg retains its original fitted holly wood box, the lining gilt-stamped in Cyrillic below the Imperial eagle, Fabergé, St. Petersburg, Moscow . (see picture below). 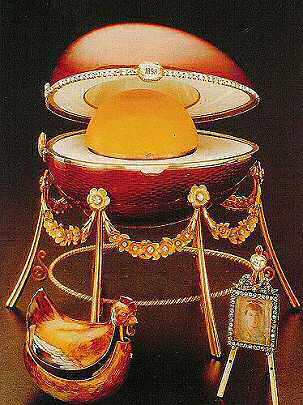 The present Easter Egg is one of a series of hen-and-egg creations by Fabergé, of which a small number have survived. The nearest parallel is the Quisling or Scandinavian Egg which closely resembles the present example but for the fact that this one lies on its side and is embellished with diamonds. Both eggs are otherwise virtually identical with their red guilloche enamel exteriors, their opaque white enamel “whites,” their opaque yellow enamel “yolks” and their varicolored painted hens with rose-cut diamond eyes. Both are by Michael Perkhin and date from between 1899 and 1903. Other naturally shaped Easter Eggs include the Imperial 1885 First Hen Egg, the first of the Imperial and an unmarked egg the Lapis Lazuli Egg containing a crown in its yolk. The first Egg to have been commissioned in 1898 by Alexander Ferdinandovich Kelch for his wife Varvara (or Barbara) appears to have been this Hen Egg. Its donor and recipient are certain, but its date may be questionable, as it bears the hallmark introduced in St. Petersburg in 1899. With its diamond-set rim and frame, its two table-cut diamonds and its larger size, the Kelch Hen Egg is an enhanced version of the Imperial Hen Egg of 1885. Indeed, all Kelch Eggs are on a larger scale than the Imperial Eggs. When sold to Malcolm Forbes, the Egg was believed to have belonged to the Imperial series due both to the portrait of Tsar Nicholas II shown under one of the portrait diamonds and to the framed portrait of the Tsarevich on an easel, which was the surprise within the hen. Research revealed, however, that the portrait of Nicholas II had replaced the original recipient's monogram (BK) and that his son's portrait had replaced that of Barbara Kelch. A number of original Fabergé cases. 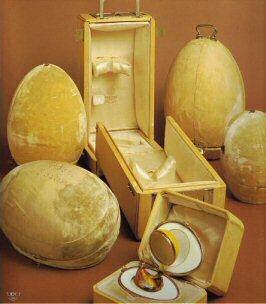 The detachable six-footed varicolored stand was ordered for the Egg by King Farouk of Egypt somewhere between 1940 and 1954. It is believed that the miniature of the Tsarevich replaced one of Barbara Kelch in the 1930's. 1898 given by Alexander Kelch to his wife Barbara. In 1920 one of the 6 Kelch Eggs sold by Morgan, Paris, to A La Vieille Russie, Paris. 1928 sold to a US buyer. Ca. 1940 bought by King Farouk of Egypt. March 1954 sold by Sotheby's Cairo to A La Vieille Russie, New York. 1961 Collection Lansdell Christie, New York. 1966 Negotiated private sale by A La Vieille Russie, New York, to the Forbes Magazine collection, New York. February 2004 Sold by the Forbes' family to the Vekselberg Foundation/The Link of Times-Collection, Russia.